Murray Gray, aged 17, astride his 1938/39 Triumph 600S shortly before immigrating to New Zealand. ​Murray Gray can lay claim to many achievements in his 80 years. Not only has he ridden motorcycles since his teens in the United Kingdom, he is also part of a handful of New Zealand distance riders to have ridden 25,750km in 384 hours. To help those readers who may not have a calculator in easy reach, that’s sixteen 1,609km-in-24-hour rides, also known by the metrically illiterate as thousand milers. Impressive as this achievement may be, the last of those was completed by Murray and a couple of his mates immediately after his 80th birthday in January 2016. This milestone was met with congratulations and praise from family and friends. The New Zealand Distance Riders were proud to help Murray achieve his goal, and organised the route based on some of Murray’s favourite roads – which started and finished at Murray’s Waihi home – as well as coordinating Brian “Rusty” Hickson to scrutinise bikes before the start, and preparing rider notes booklets and completion certificates. 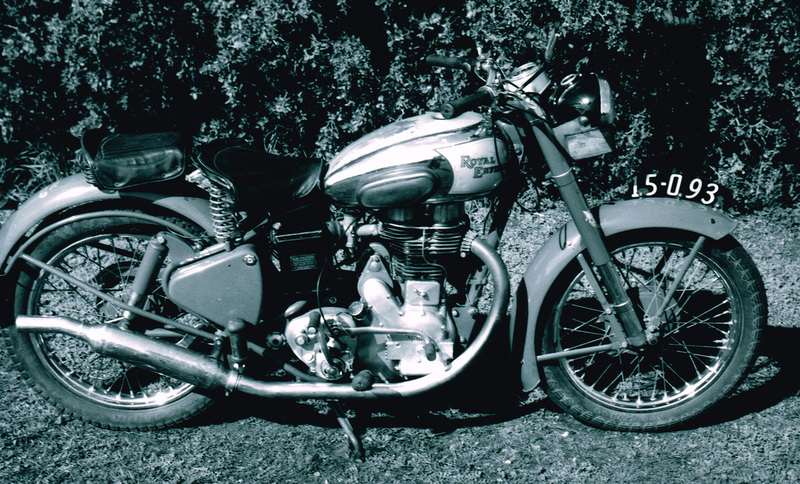 Murray’s entry to New Zealand motorcycling – a Royal Enfield Competition Bullet. He should have bought the Triumph Speed Twin. ​Murray says he was first exposed to motorcycles in his last years of school. A keen freshwater fisher, a mate who owned a bike used to pillion him to favourite fishing haunts around Suffolk and Norfolk. His father also demobilised after WWII with an army issue BSA so he could get to his regular territorial training commitments. Murray also used to pillion with his Dad. Turning 15 in January 1951, Murray left school and started a career in agriculture involving academic studies and on-farm work experience. In his second year, his dormitory room-mate arrived with a BSA Bantam. Murray took it for a ride and was hooked. After some successful parental lobbying, Murray became the proud owner of a 1938 Triumph 600. Standing 193cm tall at age 15, Murray’s Dad thought he would be too tall for a Bantam. Reliability was an issue for the Triumph for the time he owned it. It was pushed as well as ridden around Ipswich and Felixstowe, rolling countryside where the hills felt much steeper when pushing one’s bike, rather than riding it, Murray says. Soon after Murray immigrated to New Zealand, where he scored a job on a poultry farm owned by the Green family near Wanganui. Rod Coleman’s bike shop in town soon captured Murray’s attention and he was attracted to a Triumph Speed Twin and Royal Enfield Competition Bullet. Murray chose the Bullet. With hindsight he says he should have chosen the Triumph. His first big trip on the Bullet was to Mrs Green’s son’s place at Otorohanga. 1950s North Island roads weren’t flash, and neither were Murray’s motorcycle nor his riding apparel, particularly given North Island weather. Murray’s journey from Wanganui took him to New Plymouth and then onwards to Otorohanga via Mt Messenger and the Awakino Gorge. Slippery unsealed roads, narrow bridges and collisions, sometimes with oncoming traffic did not cool his enthusiasm. Murray’s route back to Wanganui was to take him through Tauranga, Rotorua and Taupo. Murray says that New Zealand distances had not yet registered with him. Engine repairs were needed along the way from helpful garage owners but the bike finally died at Putaruru. This resulted in Murray returning to Wanganui by bus and train, with the bike being sent onwards by train at a later time. That bike was sold shortly after. Other life events paused Murray’s biking passions until 1987 when, inspired by a dream, he journeyed into Te Puke and bought a Honda Sabre 750. Soon after he joined Ulysses. Working in a dairy factory limited his weekend riding as Murray balanced his riding with his family commitments. The Sabre soon gave way to a BMW 1000 Flying Brick, then to a later model BMW. An interest in Honda Goldwings then developed. Murray saw a Goldwing 1200 for sale in Dunedin. He flew down and rode it to the Cold Kiwi, with a borrowed tent and camping gear. He was so impressed that he bought it, rode it back to Te Puke and sold his BMW. Since then Murray has owned a Goldwing 1800 and now his Kawasaki 1000 Concours, which he has had for 14 years. That’s bike number 16. So was this last 1,609km ride Murray’s last? He’s thinking that with a lighter bike he could be a starter for the October North Island 1,600. Whatever he decides, Murray Gray is a Distance Riding Legend.